Features top loading channel for easy and fast graphic changes. Heavy-duty metal construction for many years of use. Sophisticated design to easily match any location. Comes with non-glare lens to protect graphics from reflection and tampering. Double-sided to maximize your graphic exposure. 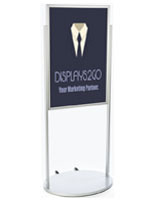 These menu holders, sign displays add a sophisticated look to your advertisements. 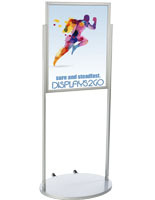 These sign displays are designed for indoor use to highlight your information, posters, advertisements and events. Built with a sleek and sophisticated design, these sign displays can easily blend into any environment. 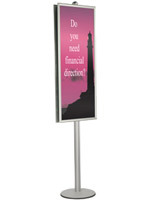 These poster stands, sign displays provide a practical yet efficient means of displaying your signage. 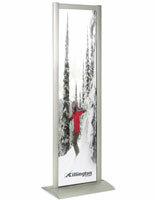 Constructed from aluminum with a beautiful satin silver finish, these sign displays can last for a long time. The entire unit is durable, making it great for use even in busy areas. Featuring a top insert sign channel, graphics can be changed in seconds with these sign displays. We supply each of the sign displays with a non-glare lens to protect your graphics and prevent glare from hindering visibility. Simply place your image beneath the anti-glare lens, slide them into the sign channel, and your advertisements are ready to be displayed! 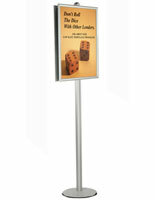 The graphic channel measures 1/4"d. Display any 24" x 36" graphics on both sides using these sign displays. 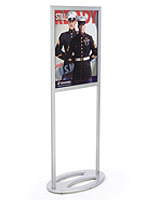 Sign displays, also known as poster holders, are ideal for use in foyers, lobbies, entryways, restaurants, banks and retail stores. The unit is shipped unassembled in order to keep shipping costs to a minimum. 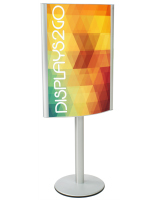 Enhance your graphic exposure today with these sign displays. 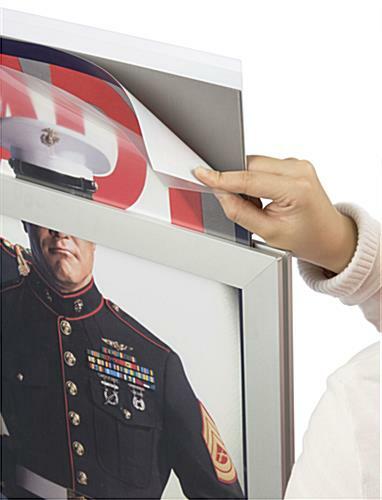 Please Note: Although these frames are designed to hold a 24" x 36" poster, please allow 1/4" on each side of your image to be covered. For indoor use only. 28.5" x 66.0" x 16.0"
Appears to be well built and still light weight enough to easily move around. Accurate to size and looks great. We're glad to hear you're satisfied with your order, Patrick! Thanks for shopping with us.